Hamburg, 6 March 2012 – German gaming peripherals manufacturer, ROCCAT Studios, has introduced a groundbreaking technology called the ROCCAT™ Power-Grid that – for the first time in the history of PC gaming – lets players control their games and computer with their smartphone. And, in what is surely music to the ears of many players, the Power-Grid is completely free to get started. The free-to-download Power-Grid is a tool that lets gamers connect, monitor and control their game and PC in real time while staying completely absorbed in the action. The app comes standard with four control displays – or “grids”. Three grids have been preloaded with a wide range of essential gaming tools – and the fourth is completely customizable. The first of Power-Grid’s three pre-installed control grids is called the “Incoming Center”. It routes all outside voice and text communication – from Skype™, Facebook®, TeamSpeak, Twitter, etc. – to an at-a-glance display on the gamer’s smartphone. This means players can get messages from friends and teammates while staying in the game. The “Stats Control” grid also comes preloaded with Power-Grid, letting gamers quickly and easily monitor their computer’s vital data via their smartphone – info such as CPU status, hard drive space and network traffic. The third preloaded display is the “Sound Control” grid, which allows gamers to set and fine tune every aspect of their gaming audio using just their smartphone. Gamers can even change audio settings in, for example, Skype™, with in-game music, or with their media player together or independently – for custom-tailored audio control made simple. In addition to the free Power-Grid app, gamers will need to download the free ROCCAT Power-Grid Launcher from www.roccat.org. This program not only connects smartphone and PC, it also features a powerful editor that lets players create their own custom control icons, or “blocks” – like individually-designed macro buttons from their favorite games, or specialty buttons like a pizza timer – for the ultimate in command customization. Plus, users can easily share their self-styled blocks and grids with teammates, colleagues and friends. At the end of the year gamers will be able to connect their Power-Grid-loaded smartphone to ROCCAT Smart Gear – new gaming hardware that delivers the ultimate smart gaming experience. First on the horizon is Project Phobo – the “Phone Board”. The Phobo is not only one of the world’s most advanced gaming keyboards, it’s also the perfect home for a smartphone using Power-Grid. And once gamers have connected their Power-Grid-enabled smartphone to the Phobo, they’ll never need to separate the two. That’s because players can write any kind of text message using the Phobo’s keyboard – via Facebook®, Skype™, TeamSpeak, you name it – and because the Phobo also lets gamers take voice calls with a connected headset. And while connected, the Phobo will naturally charge a user’s smartphone in case they do need to unplug it. And following in the footsteps of the world famous ROCCAT Apuri Active USB Hub with Mouse Bungee, ROCCAT plans on introducing the Apuri 2.0 – a ROCCAT Smart Gear gaming assistant that acts as a stylish stand for a gamer’s Power-Grid-enabled smartphone – and is the perfect way to keep it charged for when a player needs to step away from the game. Select attendees will be able to see the Power-Grid in action for the first time at CeBIT 2012. And everyone can apply to be a beta tester at power-grid.roccat.org. Initial versions of Power-Grid work with all Apple iPhones using the latest version of iOS, as well as with the iPod touch. In addition to a compatible smartphone, Power-Grid requires a PC with Wi-Fi capability. 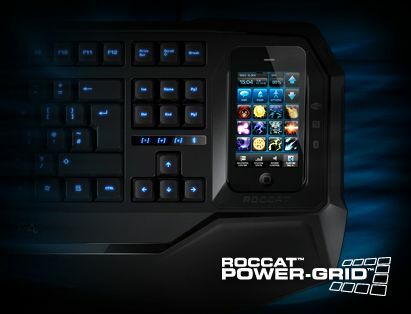 ROCCAT will launch Power-Grid for Android smartphones at gamescom 2012.